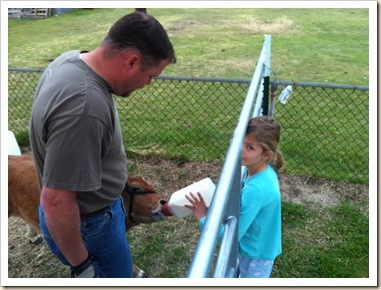 Well, it’s been about 2 weeks since we introduced Patches to our farm/family. So it seems time to introduce the next member : Chloe! 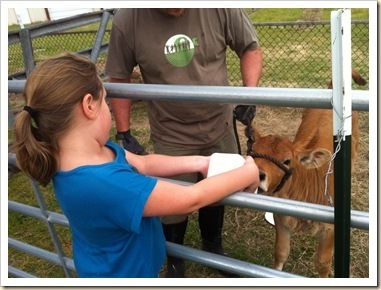 She is a heifer calf, who is destined for great things….t-bones, brisket, fajitas, and many more! 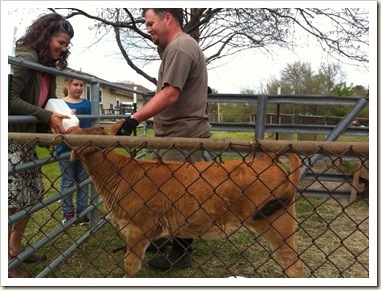 But seriously, we acquired a new calf that we are currently bottle feeding in our back yard, and hoping to get her big by grazing her out on the pasture! 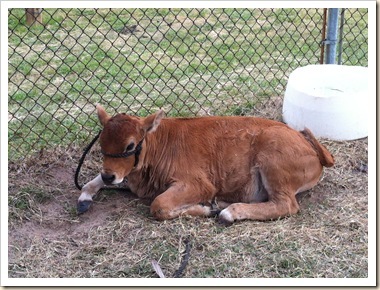 We were thrilled to learn she is a limousine breed – which is a good beef breed. The auction was so quick that Robert did not have any idea what she was, or that she was a she and not a he. Fun times!! 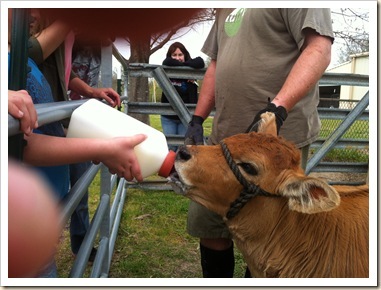 Of course everyone wants a turn, and even friends want to get in on the action – here is Kate feeding Chloe too! Kate was less than thrilled that we will eventually eat Chloe, but that is okay too. We think she is pretty cute, and right now we are trying to get her to warm up to us. Eventually she will come running when we call her, since she will expect treats and food, but for now, she is penned in the backyard so we can get her settled and used to us. Life is never slow or dull around here!! Just wondering, but why would you buy a female for meat?